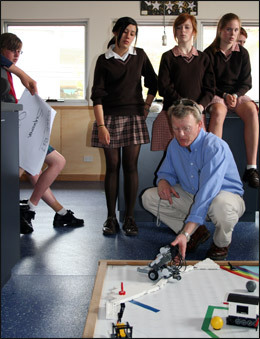 The First LEGO League in Tasmania, 2008. 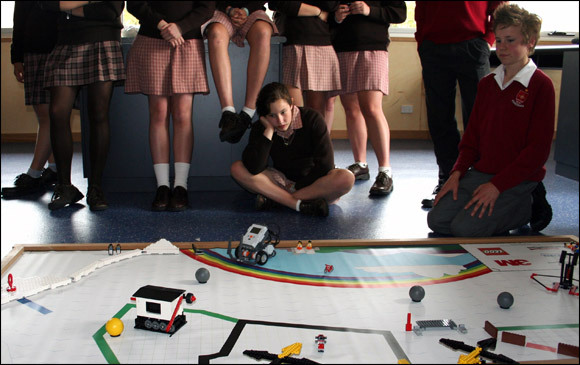 On Monday the 3rd of November MacKillop Catholic College hosted the first ever Tasmanian competition of FIRST LEGO League (FLL). FLL is a curriculum based Robotics competition that is held throughout the world with it’s epicentre in the United States where thousands of schools compete each year. Designed to marry a themed robotics challenge with a topical presentation – this year’s being “Climate”, teams are encouraged to complete as much as possible of a robotics challenge and provide a solution to a “climate” related issue on both a global and local scale. For the past six weeks, the Year 9 Science Extended class from MacKillop and a Year 8 Science class from Ogilvie High School have been very busy preparing for the competition. In a unique arrangement initiated and supported by the University of Tasmania Engineering Faculty, both schools enjoyed a terrific cross sector partnership and shared knowledge and experiences over the six weeks to make the day happen. Judges for the day included a retired University lecturer, a RoboCup Junior Soccer Manager and two engineering graduates, who gave freely of their time to participate and help out for this historic occasion. The two challenge rounds of robotics were separated by the PowerPoint based presentations. After a day of lead changes it was the team of “PaperWeight Juggernauts” consisting of roboticists Nathan Nikolai and Patrick Sherlock and presenters Laura Harris, Megan Talbot and Renee Granger who finished clearly in front. Their entry was videoed on the day and will form part of a DVD that will be used to compete (in their absence) at the upcoming FLL tournament in Melbourne. It was wonderful to have the Ogilvie girls join us at MacKillop for the day and to see them fully embrace the concept, challenges and spirit of the day. Their teacher, Susan Bowler, played a very important part in this happening. Other teachers from other schools popped in throughout the day to witness the birth of FIRST LEGO League in Tasmania and liked what they saw. I certainly look forward to writing next year of the expansion that will occur due to the efforts of all concerned in making this year’s inaugural tournament such a success. This report is part of MacKillop College’s Newsletter, which can be viewed in full at http://www.mackillop.tas.edu.au/current.htm (accessed 9Dec2008). Chris Bracken's web site, which includes useful teaching material and some links to other robotics sites, can be seen by clicking here.